We’re celebrating Stampin’ Up!’s 25th anniversary all year long, but during the week of the actual date (25 October to be exact) we thought we should pump up the party even more. So what better way than a sale on the very products that started it all: stamps, of course! Offer: Get 25 percent off 25 stamp sets. Hi, My name is Vanita Hurbuns and I have two wonderful children aged 10 and 7. I live in Albany, Auckland, New Zealand. 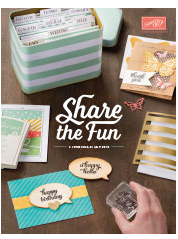 I signed up to become a Stampin' Up! Demonstrator in May 2012.